If we are able to win 150-170 seats, who knows what might happen? Telangana Rashtra Samithi (TRS) Working President K.T. Rama Rao believes that with 150-170 Lok Sabha seats, non-BJP and non-Congress parties will emerge as the biggest bloc in Parliament and decide who the next Prime Minister should be. Rama Rao, who is the number two in Telangana’s ruling party, says that politics is the art of the possible and anything is possible post-May 23, when the results of the general elections will be announced. The young and suave leader, who is Chandrashekhar Rao’s son, shared his thoughts on various issues during an interview. “We strongly believe neither UPA nor NDA will have a clear mandate. There are many non-Congress and non-BJP parties which are very strong. If we are able to create a platform where we all can get together, root for our respective states in more federal setup, I think that will augur well for the country because ultimately stronger the states, stronger the country. “I strongly believe both UPA and NDA will be short by huge numbers. This might sound a bit far-fetched but I would not be surprised if NDA ends up at about 150-160 and UPA ends up at about 100-110. There is lot of room for many possibilities, many permutations and many combinations,” KTR explained. What he thinks was the narrative around which elections are being fought? “The narrative, is, in fact, reflective of the intellectual bankruptcy in the so-called national parties – both BJP and Congress. One party says ‘chowkidar chor hai’ and the other party says ‘mein bhi chowkidhar’. The real issues of this country like health, education, jobs and infrastructure are not being discussed,” KTR replied. “We are more nationalistic than the BJP or the Congress. When Pulwama happened and Wing Commander Abhinandan was in captivity of Pakistan, our Chief Minister and our entire party suspended all political activity for a week but neither Rahul Gandhi or Narendra Modi suspended their political engagements. The people of India are wise enough to see through this jingoism which BJP would like to call as nationalism. I definitely see a bit of jingoism in their attitude which is only ephemeral,” KTR maintained. Did he agree with the view that only national parties can better safeguard the country’s interests? “This may sound a bit exaggerated, but there are no national parties in the country. There are regional parties and then there are bigger regional parties. Look at the Congress – they are out of power in 20-plus states in the country. Congress hardly has any presence in 270 seats. Likewise, except Karnataka, the BJP’s presence is minimal or non-existent in other southern states. “The Centre, nucleus, large figure etc are good to listen but today’s debate is not about Modi versus Rahul. 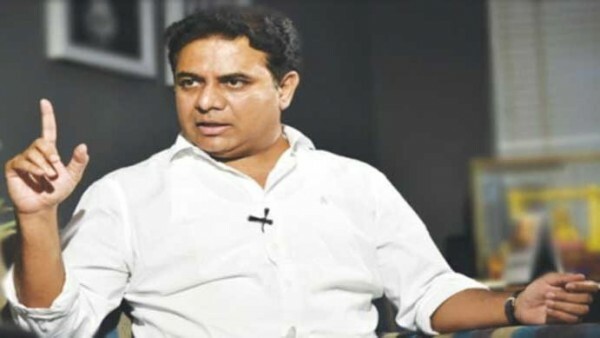 The country has other choices and capable leaders,” KTR explained. It has been a year since KCR proposed an alternative front but there is hardly anything on the ground. How did he see the road ahead? “Even the UPA came into being only after the 2004 elections so, therefore, it doesn’t take much. Between non-Congress and non-BJP parties if we are able to win 150-170 seats, who knows what might happen? There is a good chance all these parties sitting together can decide who the next Prime Minister should be. It is not out of the realm of possibility. “When India was shining, according to NDA in 2003, nobody thought in their wildest dream that Manmohan Singhji will be the Prime Minister for the next 10 years. Likewise, nobody in their wildest dreams thought Narendra Modiji will be prime minister in 2014. “When somebody today says Modiji will lose and he will not get the numbers, it somewhat sounds impossible because we are creatures of habit. We are habituated for the last five years to seeing Modi as PM. When somebody says he is going to be dislodged, it will take a bit of time for you to absorb and process. Let us see how things pan out,” KTR reasoned. Does he think as the anchor of Federal Front, KCR will be its leader and a possible PM candidate? “It’s not about leadership or showmanship. We are talking about statesmanship. We are saying our Chief Minister has given direction to our state, his schemes have been copied by no less person than the Prime Minister. Therefore time has come where we believe he can offer more value in terms of his schemes, his projects, his thoughts which can certainly be put to good use on the national stage. Whether he will be in driver’s seat or he will be in a position to ensure that with our support government comes in something we will have to wait and see until after elections.